Optimum Security is your full-service security solution provider in Tofino, BC. We offer a complete range of professional security services that includes mobile security patrols, uniformed security officers, and security system and alarm monitoring. Our team of experienced security experts take pride in exceeding your expectations through our professional, meticulous approach to private protection. We are among the fastest-growing security companies in BC and Alberta, and our client list includes prominent organizations, businesses, and individuals throughout Western Canada. 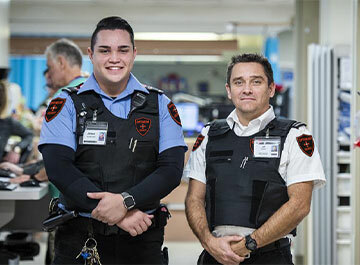 Our Tofino uniformed security officers are carefully screened and selected to meet world-class standards when working in sensitive environments such as private residences, resorts, restaurants and commercial sites. Each of our uniformed guards is carefully selected to match to your specific requirements, whether you need assistance with crowd control at a special event, a static guard to monitor access to your business, or regular uniformed patrols to conduct perimeter checks at your property. Our mobile patrol division in Tofino can help keep your property protected with both regular and random checks. We use modern, GPS-enabled security vehicles that are clearly marked to deter vandalism, theft, and other unwelcome actions and threats to your assets. Optimum Security can design a comprehensive security solution package that includes a combination of uniformed security guards, mobile patrol services, and security alarm monitoring complete with CCTV recording. To learn more about how Optimum Security can help enhance the security of your Tofino property or event, contact us today for your confidential security assessment.